We get it—babies are ridiculously cute. They get to bask in all the newborn glory, with friends, family and passersby fawning all over them. But don’t forget the new mom. Give her a gift that’ll help her celebrate her new role. These picks are sure to please. Removable and repositionable wall decals? Genius. These Polaroid photo stickers push the charm factor over the edge. They're a clever and creative way to showcase favorite family photos—plus, you can add captions for extra appeal. 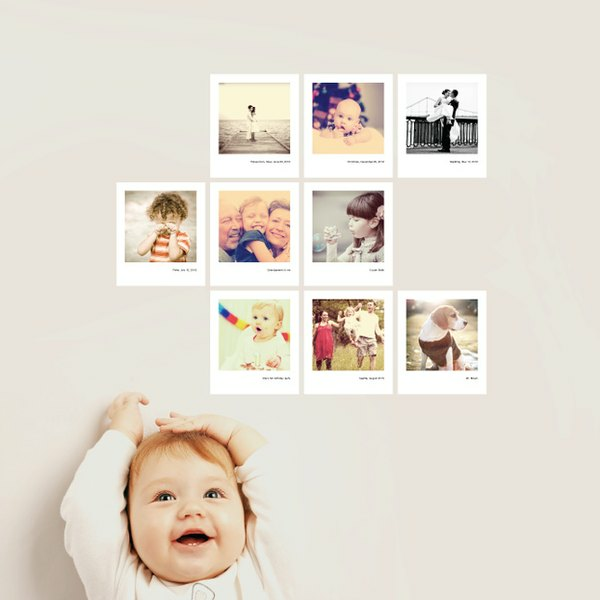 Nine Polaroids in all, they are perfect for decorating Baby’s nursery, or quite frankly, any room in the house. Put Baby’s face on her phone. Create a custom case for her iPhone, iPad, Android and more with a photo of her favorite new person. Maximum protection + maximum personalization = maximum perfection. No joke, these bags are a must for every new mom. Choose the zip-top design—no one wants beloved blankies or bottles falling out when on the go Baby. And getting it monogrammed with Baby’s name or Mom’s initials is a must. Trust us—she’ll love it and it will last throughout the years. What’s in a (baby’s) name? For new moms, everything. She took all that time and consideration in naming her little one; now let her show it off to the world. Initials, names, monograms—anything that has to do with Baby’s name, the new mama is going to want. Time is a coveted commodity for all new moms. She barely has enough time to shower, let alone organize all of Baby’s photos and milestones. So help a mother out. Blurb gives you the tools to create beautiful, artistic memory books. Talk about a brag book! Having endless hours to shop with your girlfriends basically goes out the door once Baby comes along. Enter the Birchbox—it does the shopping for you. Get her the gift of monthly deliveries of high-end beauty products from top brands. Also, it just might encourage the new mom to get out of the sweats and have fun getting a little gussied up. Keep that glow going, post-pregnancy. Laurie Gunning Grossman is an editorial director at eHow and has contributed to numerous online publications including Fine Living, The Cradle, Modern Mom and Disney's Babyzone. Her interest and expertise focus on lifestyle content, including design & decor, food, health & wellness, DIY and family life. Can I Make Brownies With Confectioner's Sugar?